Built for fitness rides, commuting or zipping around town, this speedy new E-bike has a lightweight ALUXX SL aluminum frameset with hydraulic disc brakes and rack mounts. 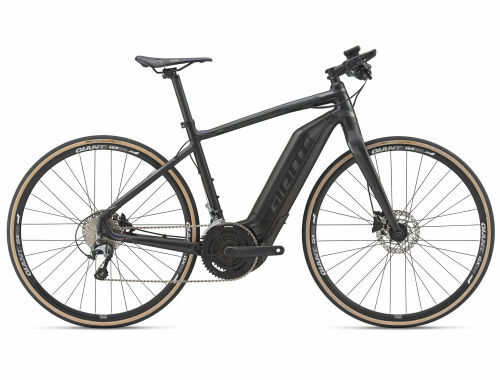 It’s designed with flat-bar rider positioning, which balances confident stability with smooth-riding efficiency—so you can ride greater distances in a shorter amount of time. The SyncDrive Sport motor with 350 percent tunable support lets you fine-tune the ride just the way you want. The RideControl EVO features navigation and fitness data that you can control through the Giant E-bike app. And with its 500Wh Giant EnergyPak, you can travel far and be sure you’ll reach your destination. The SyncDrive Sport motor with 350 percent tunable support lets you fine-tune the ride just the way you want. The RideControl EVO features navigation and fitness data through the Giant E-bike app.